I made you a homemade chocolate cake! 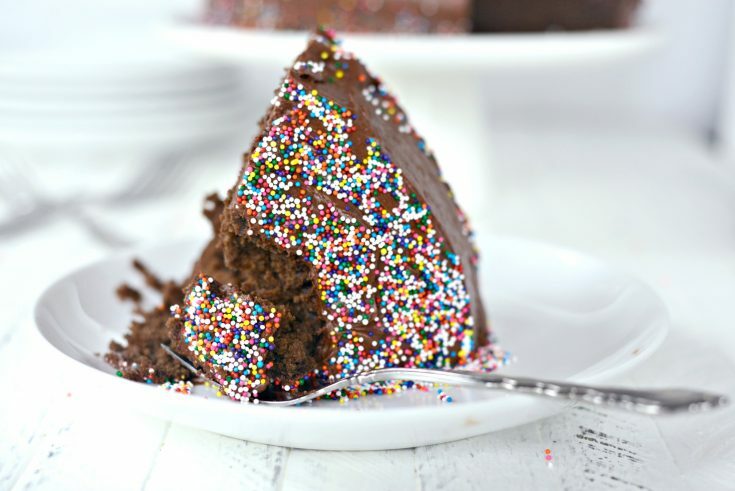 A cake that’s all chocolate and has an obscene amount of sprinkles on it. Because it’s Friday and I’ll be turning 36 on Monday so let me eat my feelings I’m gonna do what I want. Sprinkles. Chocolate. Yes. One tradition that I remember and loved growing up was that my mom always let us girls pick out the flavors for our birthday cake. Mine was usually chocolate cake with chocolate frosting. 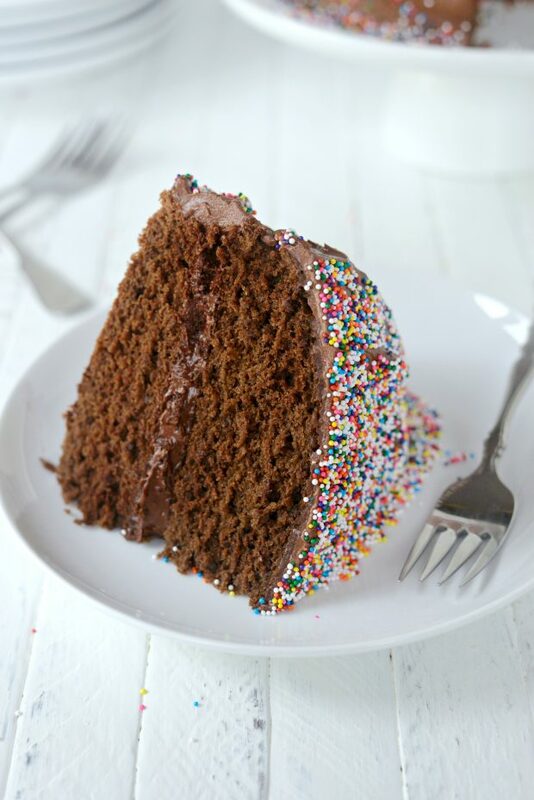 I’d eat the cake, leaving the frosting trenches behind because I disliked frosting, why? I have no idea. Eventually I skipped birthday cakes altogether when I discovered cookie bars and cheesecake. Nowadays I’m all about cake. This particular chocolaty cake I made using homemade chocolate cake mix. If you follow me on snapchat (laurie.mcnamara) then you saw just how it all went down. 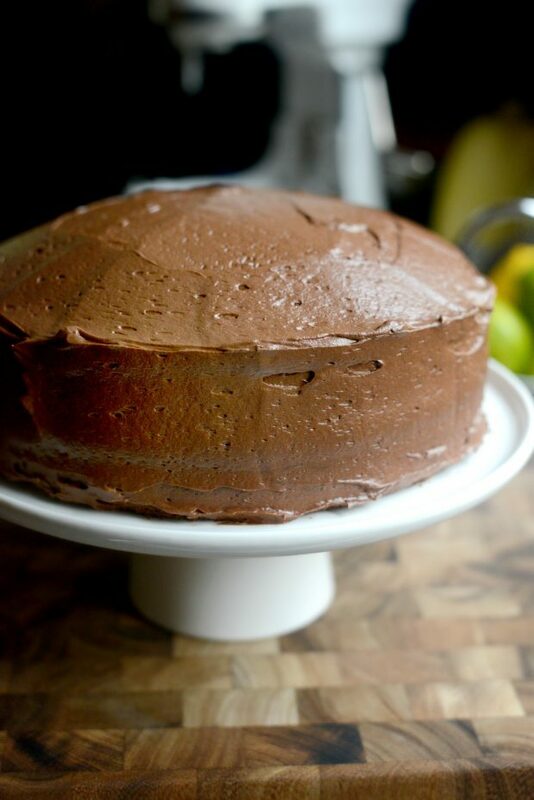 It’s chocolaty, moist and delicious, but most importantly easy. I know, I said the m-word but how else does one adequately describe cake avoiding it? It’s impossible. 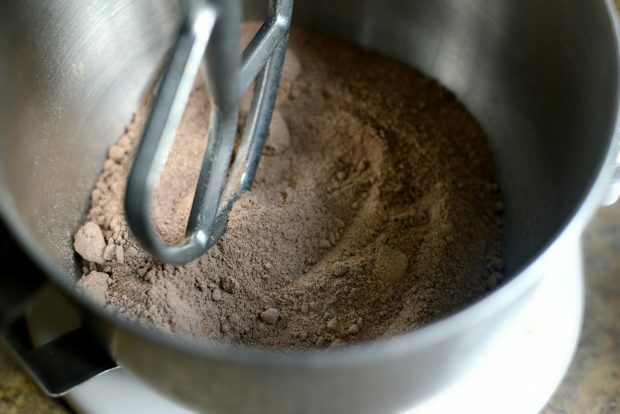 Start by emptying 1 recipe of the homemade cake mix into the bowl of your stand mixer, fitted with the paddle attachment. 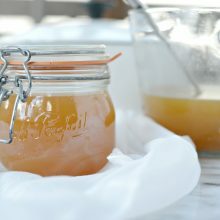 With the mixer on low, pour in 1 cup water and 2/3 cup grapeseed oil. Add in the vanilla and mix on low to incorporate. 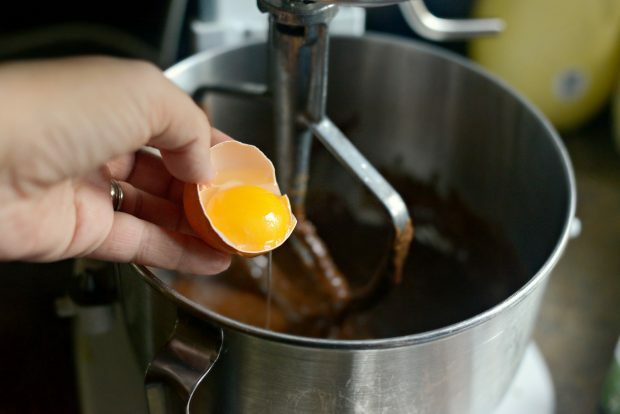 Add in one egg at a time, scraping down the sides of the bowl after each egg. 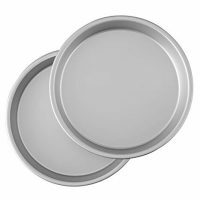 Divide the batter among two buttered, floured and parchment lined cake pans. 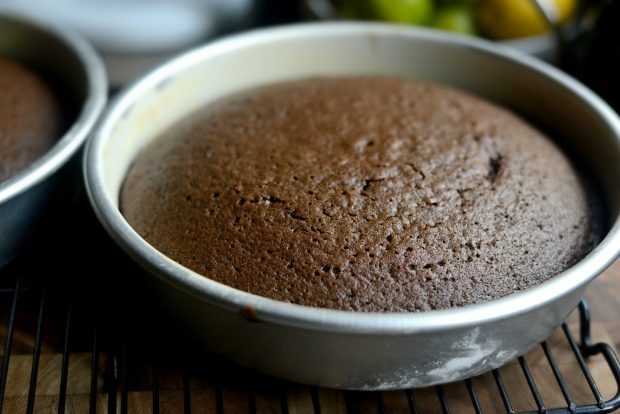 Want to know how to line a cake pan? This is how I do it: I grease the entire pan with unsalted butter, add in a little flour (about 1/2 tablespoon ish) and tip the pan so it coats evenly, then I tap out the excess. Then I place a round of parchment in the bottom of the pan. 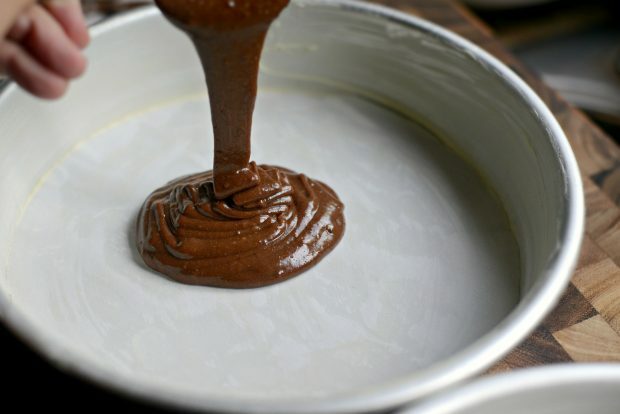 Here’s a link showing you how to line a cake pan. Tap the pans on the counter to release any air bubbles. Then slide the pans into a preheated 350° oven and bake for 25 to 30 minutes or until a tooth pick comes out with only a few crumbs attached. Be sure to rotate the pans to ensure even baking. Allow the cakes to cool in the pan for 10 to 15 minutes before running a knife around the edge and turning them out onto a wire rack to cool. The base recipe of this frosting comes from this post, the only difference being that I used both almond and vanilla extract is. All that’s left to do is frost the cake! Obviously I need lots of practice. 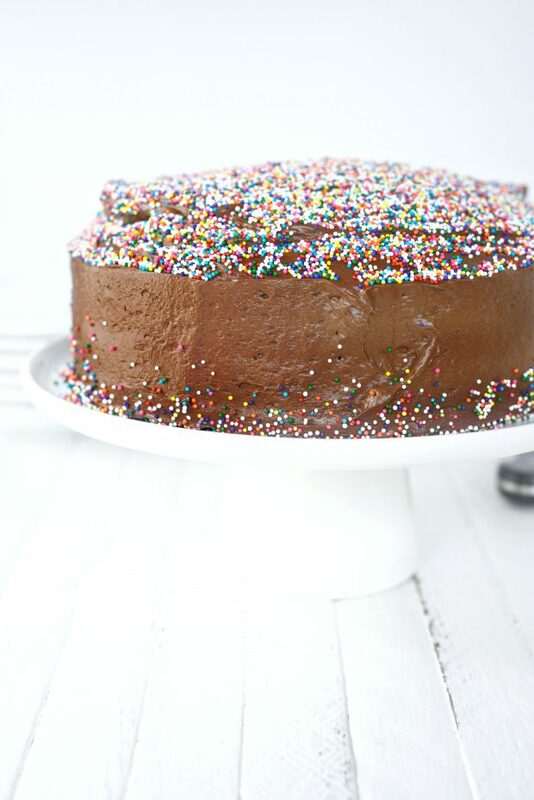 However when in doubt, cover in sprinkles!!!!!!!!!!! This cake was a hit! My daughters came home from school and had a slice for snack. <—- mom of the year! 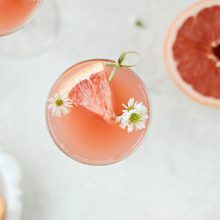 Then the next day I sliced a huge quarter out, slapped it on a plate and shoved it at my daughter to take with her to her BFF’s where her and her 2 friends could attack it with no-fear-of-calories gusto. 3 teenagers and cake is always a winner. Enjoy! 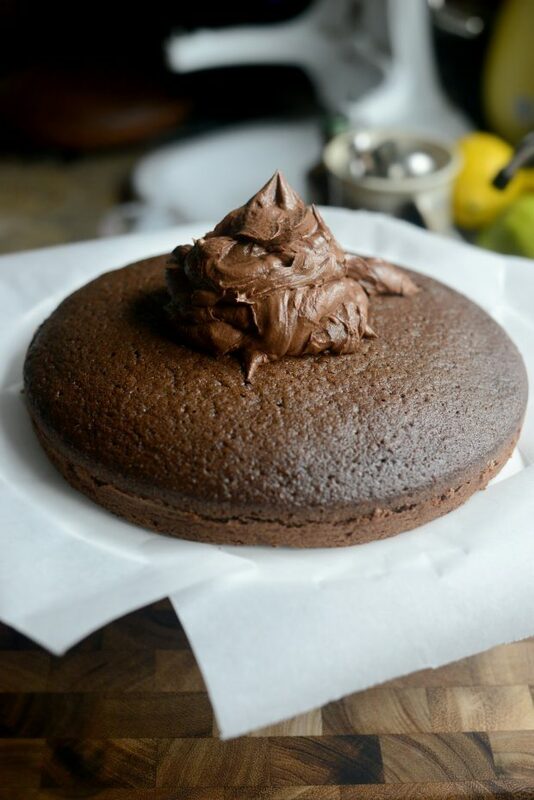 And if you give this Homemade Chocolate Cake recipe a try, let me know! Snap a photo and tag me on twitter or instagram! 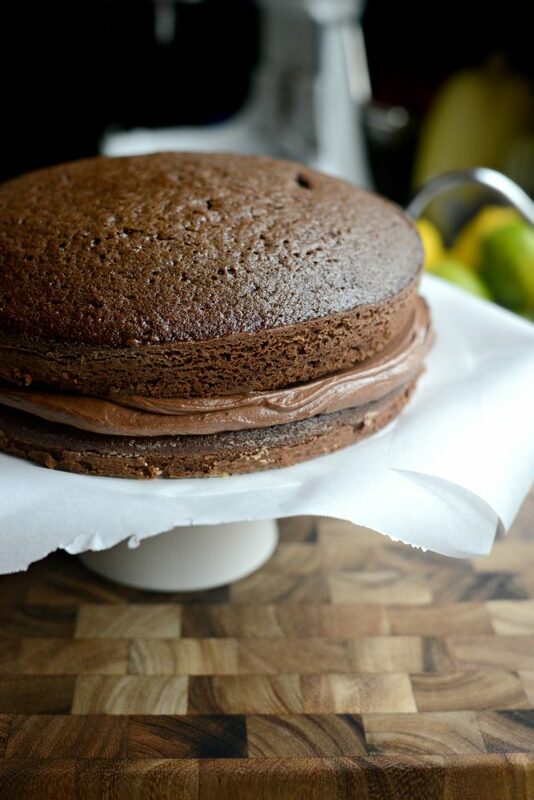 This chocolate cake is made form a mix, my homemade chocolate cake mix that is! 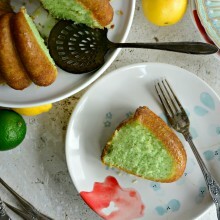 It's so much better than box cake mix! 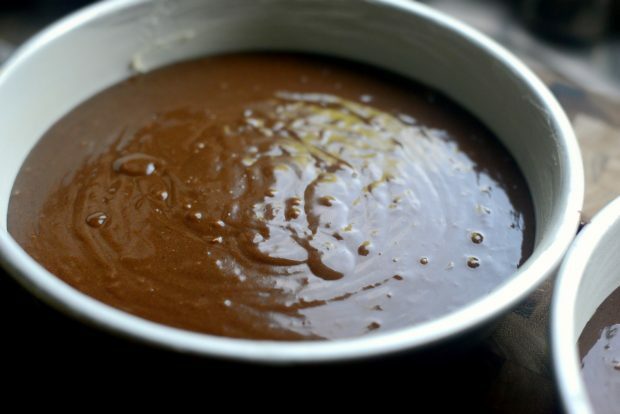 Moist, chocolaty but just as easy! 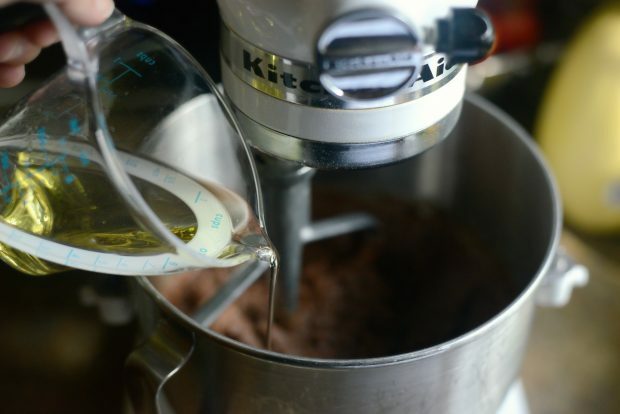 Into the bowl of your stand mixer fitted with the paddle attachment, add the homemade cake mix, water and oil. Mix on low until combined. 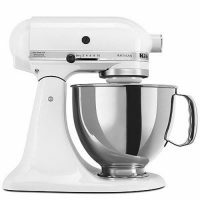 With the mixer on low, add the vanilla plus one egg at a time to the cake mixture, scraping down the sides of the bowl after each egg. Divide the cake mixture (about 2 1/2 cups each) among the two prepared pans. 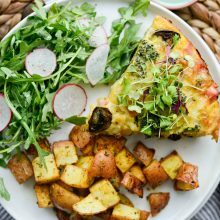 Slide the pans into your preheated oven and bake for 25 to 30 minutes or until a tester comes out with only a few crumbs attached. Rotate the pans half way through baking to ensure even baking. 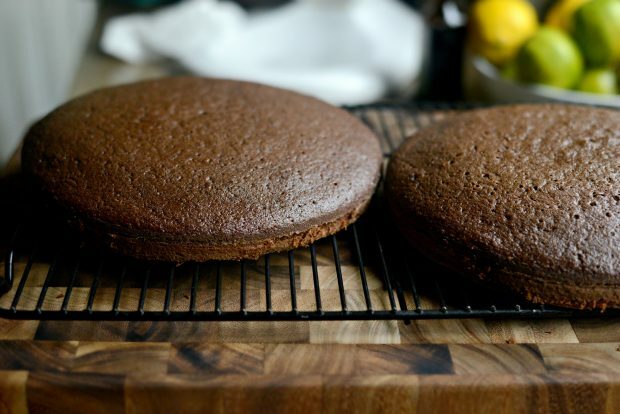 Allow the cakes to cool in the pans for 10 minutes before running a knife around the edge and turning the cakes out onto a wire cooling rack. 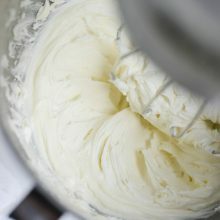 In the bowl of your stand mixer fitted with the whisk attachment, add the butter and mix on low speed until light and creamy (about 2 minutes). In a liquid measuring cup combine the whole milk, buttermilk, vanilla and almond extract. 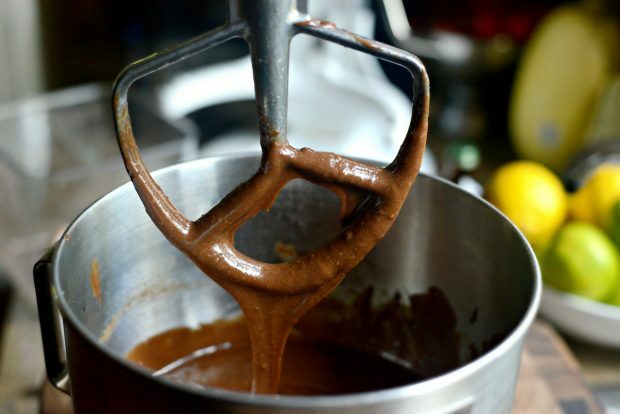 Add a few large spoonfuls of the cocoa mixture to the butter in the mixer, alternating with the liquids. Mix on low speed until just combined. Increase the speed to high and mix for 4 to 5 minutes or until the frosting is light and fluffy. Spread a teaspoon of frosting in the middle of the cake plate/stand. 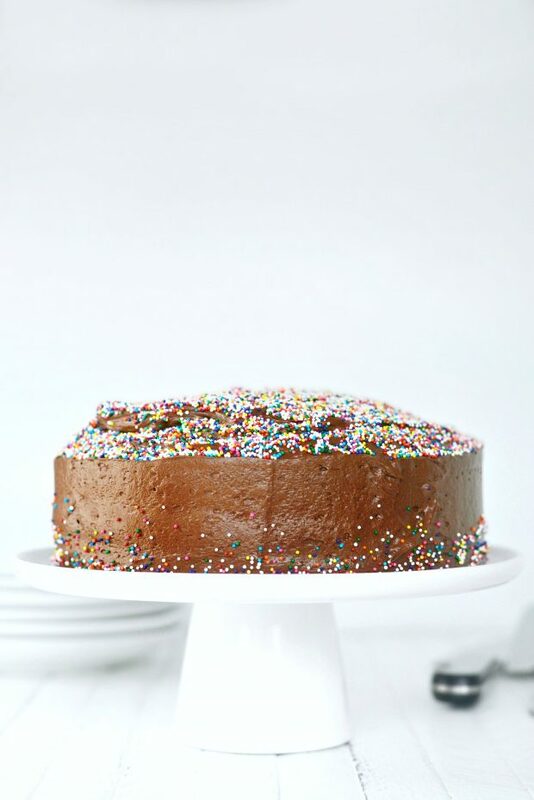 Place the first cake layer onto a cake stand and loosely place strips of parchment or wax paper just underneath the edge all around the cake. Top with 1/3 of the frosting and starting at the center, spread the frosting out to the edge, leaving a little extra frosting overhanging the edge of the cake. Place the second cake layer on top of the frosting and top it with the remaining frosting. Spread the frosting out from the center and down around the sides of the cake. The recipe for Homemade chocolate cake mix link does not work. This cake is very homemade looking rather the bakery style which keeps the process simple. Why you prefer grapeseed oil rather than and common everyday oil. As for the oil, I’ve never been a fan of common vegetable or canola oils, but if that’s what you have on hand then they would totally work. 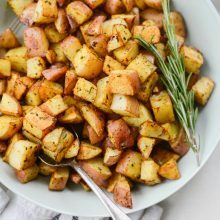 I just feel grapeseed is a healthier oil to bake with. That looks so good. Happy Birthday, by the way!!! 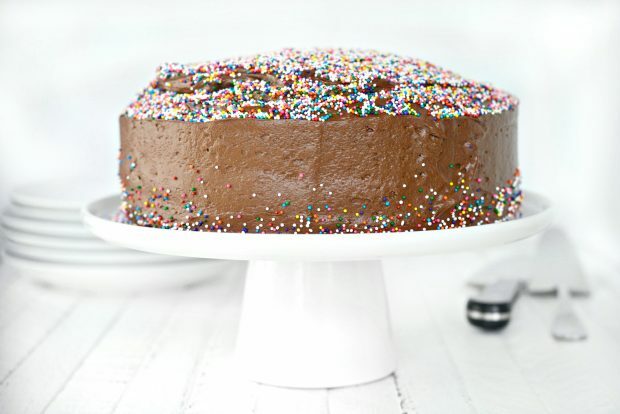 When I was young, if my mom made a cake and it wasn’t anyone’s birthday, we called it the “happy UNbirthday cake”. We put candles on it, and sang “Happy UNbirthday” to everyone. Thank you for your response and link! 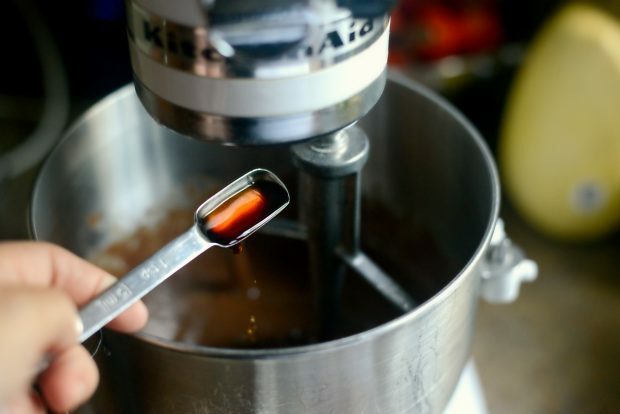 The question of the oil is usually always what is at hand, Truthfully I sill like using butter or coconut oils more these days. It is my youngest son’s birthday Monday as well! He will be 11, and I am SO going to make this cake for him. 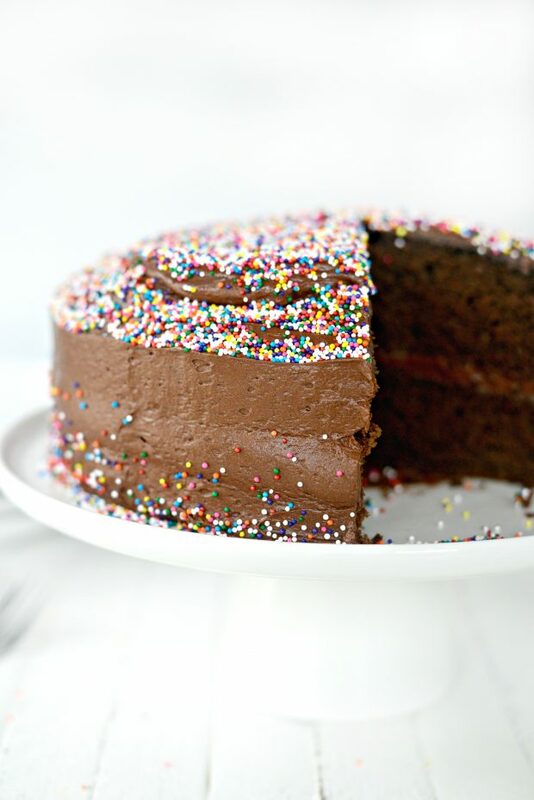 He is a huge chocolate fan, and this cake looks like it will fit the bill. Reminds me of something Eeyore would be pleased to be presented with on his birthday! Absolutely gorgeous cake! Can’t wait to try it! Happiest Day, Laurie! Hope it’s full of joy! Happy Birthday Laurie! Your food blog was the first of my now (healthy?) obsession with food blogs! 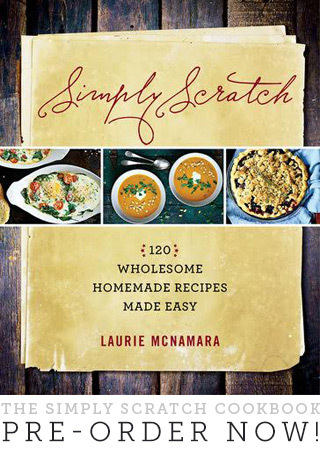 Thank you for years of yummy recipes, beautiful photos and truly laugh out loud reads! Your recipes grace our family table multiple times/week! Thank you for helping me feed my growing family!